The first wild bison to roam Banff National Park in more than a century have been airlifted into a remote valley in a "historic homecoming" aimed at re-establishing a thriving herd, Parks Canada said Monday. 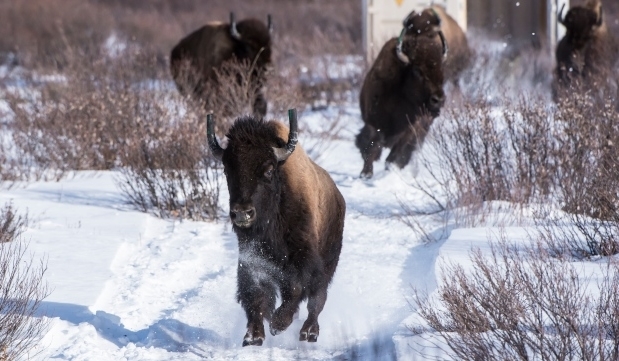 While many remember what Parks Canada calls a "display herd" of bison housed in a paddock near the Banff townsite until 1997, this new herd represents a return to wild animals, eventually free to wander their surroundings. 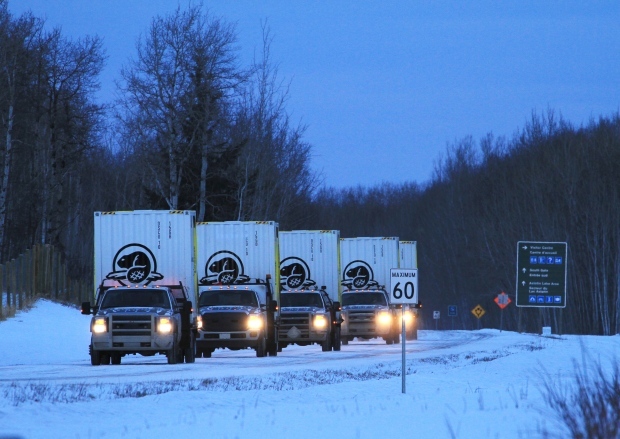 The 16 bison — primarily pregnant two year olds — were loaded onto shipping containers on trucks in Elk Island National Park, about 35 kilometres east of Edmonton, and transported to the park in the past week. 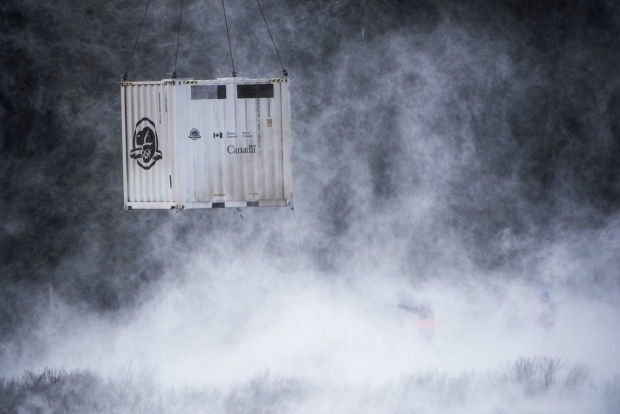 The shipping containers were ferried by helicopter over the slopes and lowered into an enclosed pasture in Panther Valley near Sundre on the eastern slopes of the park. The bison were let out into the pasture, where they'll stay for 16 months while being closely monitored by Parks Canada using radio collars. 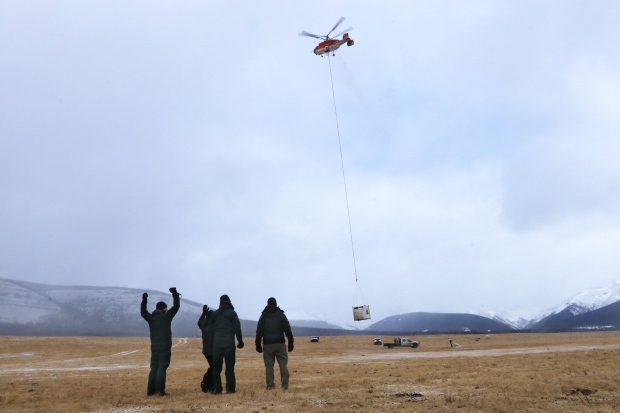 Eventually, in the summer of 2018, they'll be released into a 1,200-square-kilometre area on the eastern slopes of the park, where they can interact with other native species, forage for food and integrate into the ecosystem. Harvey Locke, a conservationist, writer and trustee with the Eleanor Luxton Historical Foundation in Banff, deemed the day a historic moment. "This is a great day for Banff National Park. It's a great day for Canada and frankly, it's one of the great days for wildlife conservation in the history of North America," Locke said. Local conservationists involved in the relocation said they were relieved the moving process went so smoothly after years of research, preparations and consultations with various groups. The longer-term goal is to re-establish a new wild population of bison in Banff National Park and help the conservation of the animal nationally and internationally. While conservation groups have applauded the idea, ranchers on the eastern slopes have criticized the plan. They're worried the bison could escape, damage property or spread disease to livestock. "Restoring wild bison … is the righting of wrong that was caused in the 19th century when we almost eliminated wild bison as a species.… Banff Park was involved in saving the species from extinction 100 years ago, and today it's involved in restoring this species as part of the landscape, as a wild animal, and that is really exciting," Locke said. Responses to "Wild bison roam Banff National Park for 1st time in more than century"
Maybe you can save the Yellowstone bison. Rumors of killing off 1300... Very bad idea. Well done Park Canada! This is a wonderful initiative that benefits the natural world and humanity. Thank you! I wonder why Yellowstone doesn't do this with the buffalo that are going to be slaughtered soon because ranchers don't want them near their cattle? Is our country that cheap? Lets go see them!! At last some good news!